Muirfield Association is pleased to pass on the following information about the 2018 FORE! Miler race. Please pay attention to the information on the rolling road closures so you can be prepared. The 4th Annual FORE! Miler presented by OhioHealth returns Thursday, May 24 at 7 pm. 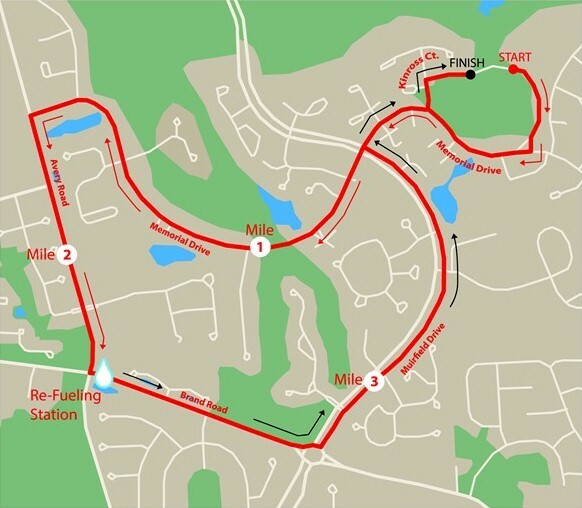 The race will follow a route that starts and ends at Muirfield Village Golf Club, located at 5750 Memorial Drive, and includes Memorial Drive, Avery Road, Brand Road, Muirfield Drive and Kinross Court. See map below. With 2,000 participants anticipated, a big community event such as this affects all of the surrounding neighborhoods, and we appreciate your support and understanding. Traffic will be temporarily detoured around all race areas from 6:30 to 8:30 p.m. on a rolling basis. City of Dublin Police Department will provide traffic control during the race. Please speak to an officer on site if you require assistance. Officers will be able to provide detour information and will strive to permit vehicular traffic to cross closed intersections when such an action can be safely accomplished. We invite you to join us in this community focused event. Help cheer on the runners or register to run or walk at www.foremiler.com We are extending to you a $5 discount for the event by using the code “18DUBLIN5”. The FORE! Miler is a 4-mile road race for runners and walkers that will kick off the 43rd playing of the Memorial Tournament presented by Nationwide. This charitable event will highlight and benefit the alliance between Nicklaus Children's Health Care Foundation and Nationwide Children's Hospital. The race has raised more than $100,000 for Nationwide Children’s since it began in 2015.